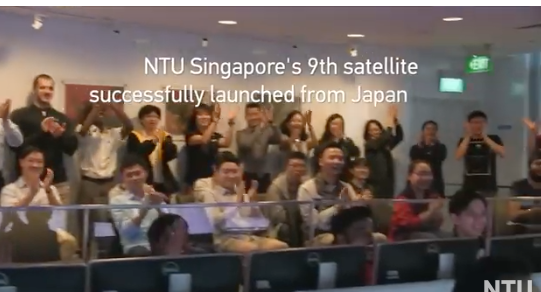 Scientists from Nanyang Technological University, Singapore’s (NTU Singapore) have successfully launched and deployed its ninth satellite. The AOBA VELOX-IV and SPATIUM-I (which was launched last October) are nanosatellites trialling new imaging and manoeuvring technologies in space. The NTU scientists plan to use their findings to build satellites robust enough to withstand what would be Singapore’s first lunar mission. The scientists believe that a lunar mission may be achievable within five years, using satellites weighing no more than 100kg each, which would be lighter than any other that has made the 384,400-kilometre journey. 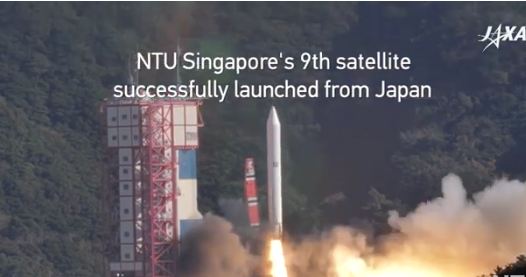 NTU’s 8th and 9th satellites were built in collaboration with Kyushu Institute of Technology (Kyutech), one of Japan’s leading universities for satellite research and engineering. The AOBA VELOX-IV nanosatellite was launched from the Japan Aerospace Exploration Agency Epsilon-4 rocket, which lifted off last Friday, 18 January, at 8:50 am Singapore time. The 2.8kg satellite carries two new technologies that will be tested and validated in space. First is a special low-light camera that can capture and observe in less than two seconds Earth’s horizon glow, a crescent of light occurring on the horizon just before sunrise and after sunset. Its second new technology is a quad-jet plasma thruster that helps the satellite with altitude control, such as when it enters a lunar orbit. The SPATIUM-I which stands for Space Precision Atomic-click Timing Utility Mission, was launched from the International Space Station (ISS) in October last year and is currently completing its first phase of experiments. The 2.6 kg satellite is the first nanosatellite in the world to successfully demonstrate a chip scale atomic clock (CSAC) working in Low Earth Orbit. This demonstrates that the ‘Built-at-NTU’ atomic clock keeps time with a stability of 0.2 billionths in a second, on a par with satellites a thousand times bigger. Such precision timing devices, which are critical to make on-board electronics function in synchronicity, are usually not found on smaller satellites due to limited space, low power supply and high cost. The SPATIUM-I is also the first in a planned series of nanosatellites built by NTU that will map out earth’s ionosphere in three-dimension (3D). This will allow NTU scientists to understand the ionospheric morphology and its perturbations that have a pronounced effect on long-distance radio communications, navigation and weather patterns. NTU Singapore Vice President (Research) Professor Lam Khin Yong said the successful launch and deployment of AOBA VELOX-IV and the SPATIUM-I respectively are important steps forward for NTU. “Building on NTU Singapore’s satellite engineering expertise over the last decade, our two latest satellite launches demonstrate our leading-edge space capabilities. We have shrunk advanced cameras, thrusters and the electronics capability of larger satellites into something the size of a shoebox,” said Prof Lam. The AOBA VELOX-IV cube satellite was built by a team led by Mr Lim Wee Seng, Executive Director of NTU’s Satellite Research Centre, while its new altitude determination and control algorithm was developed by Prof Cho’s research team at Kyutech in Japan. It has two solar panels which unfold in space to form a solar array of 30cm x 20cm. Its primary mission is to capture Earth’s horizon during sunrise and sunset, which would pave the way towards eventually capturing the Lunar Horizon Glow, a phenomenon first observed by Apollo astronauts in the 1960s. Capturing sharp images requires a superior low-light camera, altitude control algorithm and precise reaction wheels which can rotate and orient the satellite accurately at its target. Its secondary mission is to test an improved quad-jet pulsed plasma thruster that generates ultra-hot plasma gases by burning solid Teflon fuel. It is used to precisely control the satellite’s angular momentum and rotation, which would be required when orbiting the Moon in any future lunar mission. SPATIUM-I is the result of innovative engineering by a joint team led by NTU Assistant Prof Holden Li from the NTU School of Mechanical and Aerospace Engineering and Prof Cho from Kyutech. The team’s miniaturised atomic clock provides an accurate timing reference for the nanosatellite’s on-board electronics and has been successfully tested in space, opening up the possibility of synchronised working with future NTU satellites. This would allow a group of satellites flying in formation to perform joint missions, for example, the real-time three-dimensional mapping of the ionosphere plasma density, which is the ionized component of the Earth’s upper atmosphere consisting of free electrons that can interfere with electromagnetic waves and radio frequency, and in providing weather forecasting. SPATIUM-1 will also be testing out several Micro Electro Mechanical Systems (MEMS) technologies, which are miniaturised versions of the various mechanical systems used by larger satellites. One such application of MEMS will be in space-based Internet of Things (Space IoTs). Currently, land-based Internet of Things (IoTs) are leading the Fourth Industrial Revolution in manufacturing, using sensor data to optimise manufacturing plants, while Smart City applications include monitoring and optimisation of urban traffic and city services. However, land-based IoTs require infrastructure investment and have a limited range, especially where it does not make economic sense to install wireless transmission devices in smaller, remote towns and villages. NTU’s first foray into space began 20 years ago. The first project was a communication payload codenamed Merlion, while the main satellite body was developed by the University of Surrey, UK. It was launched in 1999, making this year the 20th year anniversary milestone since NTU begun its space mission. NTU has since designed, built and sent nine satellites into Earth’s orbit. The X-SAT, NTU’s microsatellite built in collaboration with the DSO National Laboratories, is Singapore’s first locally-built satellite which was launched into space in 2011. Since 2009, NTU has been running Singapore’s first satellite programme for undergraduates and postgraduates. For further information see Annex A.